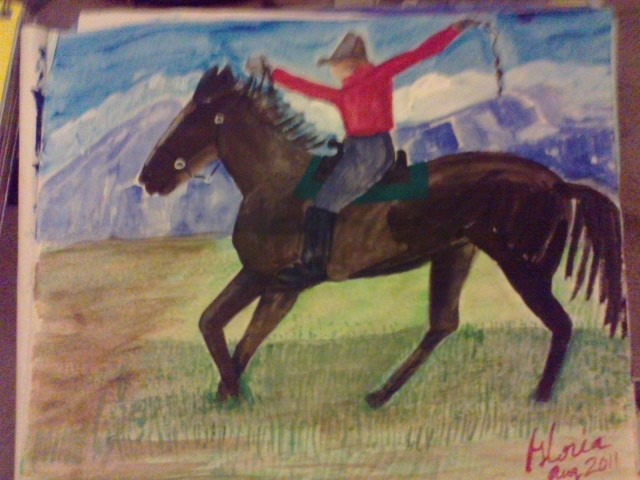 Sketch in acrylics, of a horse owner [not the jockey] riding his horse in the paddock . I painted this sketch and it is about the 7th time I have sketched or painted horses. Copyright; Gloria Poole; artist-gloriapoole; gloriapoole; gloria0817;gpoole817. Also, see my comment I added today to this post [until I could find the edit method] because it contains important information. Also, see http://gloriapoole.blogspot.com for more info and the “about me’ page on that blog of mine. Also, I do not know why there is such a difference in the size of these sketches. I did the exact same thing both times to upload them. The rodeo sketch should be the same size as the “Kentucky Bluegrass sketch.” I do not have a son [but do have two daughters, grown] ; and no one else is authorized to login to this blog but me. And I am a white, Christian, woman, divorced twice [single] who lives in Missouri but born in the state of Georgia. Copyright Notice: I own the copyright to all art I create by any method, with any tool, on any surface, medium, canvas, board, with any medium digital ink, acrylics, oils, watercolors, pen/inks, pencils whether or not I photograph them and whether or not I display them publicly in any way or upload them to any blog I create. Gloria Poole; gloriapoole; gpoole817; gloria0817; and any variation [such as numerals added or underlines, or dots] of my born with name of Gloria Poole; Missouri; 12:23pm; 6-April-2013 @ my apt in Missouri.